Aquaculture is an exciting industry but unfortunately it is a relatively new industry in Australia, only really developing over the last 30 years. Unlike the traditional agricultural industries like wheat, sheep or chicken farming, there is not a large amount of information available to new entrants to the aquaculture industry. Furthermore, the industry is in continued development, so much of the information that is available is long out of date. AABio Aquaculture offers the latest information to both existing and new entrants to the industry. 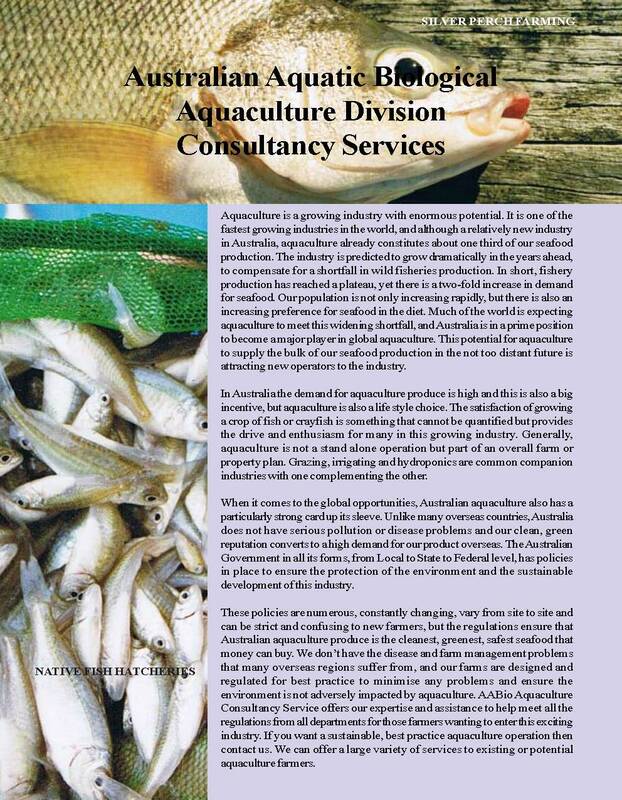 We keep our fingers on the pulse of the industry and use our knowledge to assist you in your aquaculture endeavours. We can assist if you are looking at buying a farm for aquaculture. 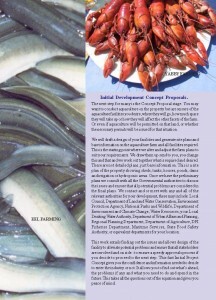 Many people are purchasing properties for the specific purpose of conducting aquaculture. To ascertain the suitability of these properties for aquaculture we can do a Site Inspection and provide preliminary advice to you on the suitability of that site for the species you intend to culture and the farming method you intend to utilize. If purchasing an existing aquaculture facility we can provide information on the production potential of the existing facilities or possibly identify any production and design faults or other areas of concern that you should know prior to purchase. Pre Purchase Proposed Initial Development Concept Proposals. You may wish to purchase a property to conduct aquaculture but are unsure if the aquaculture facility you desire will be permitted on that land. We will draft a design of your facilities and generate site plans and base information on the aquaculture farm. This concept proposal will be submitted to the Council, Fisheries and other relevant bodies for comment and preliminary approval. This fast Initial Project Concept approval gives you the confidence to complete your property purchase or not waste your money on a site where what you want to construct is not permissible. Additionally, we can create business plans and production projections based on the existing facilities and or potential for expansion of those facilities. These plans and projections are critical if bank finance is involved. approval before you can start construction. To receive approval you need to convince the local council and all government departments that your development is not going to have an impact on the environment. Your farm needs to be designed to best industry practice; to be commercially viable and environmentally sustainable, this can be a very difficult task if you do not know the answers to all the problems which may occur and what is the preferred remedy. Additionally, you will need to demonstrate that you will be able to culture the species you have applied for in a knowledgeable, safe and commercially viable method. Also, that you are aware of all the pitfalls that may occur in the future and that you have designed your farm so that they will not occur or if they do, that you can easily correct them and not impact on the industry, the environment, the community or the wellbeing of your culture species. A standard farm design and application requires a mass of information generally beyond the knowledge base of the average individual. Even if you do have the knowledge or prepared to learn, the time required for the average person to battle the paperwork usually makes it che aper to hire a consultant and let them have the hassle for you We have been doing this for over 20 years and take a very professional attitude to the development and dealing with government departments that progress at their speed not necessarily the speed you may desire. Even a relatively small development in eastern Australia will need 200 plus pages of information to be submitted and take at least 3 – 6 months to receive approval. We have been designing farms and systems and working with the industry constantly to develop the best designs. We have learnt from everyone else’s mistakes to design farms that are easy to manage, efficient, state of the art and to best industry practice. 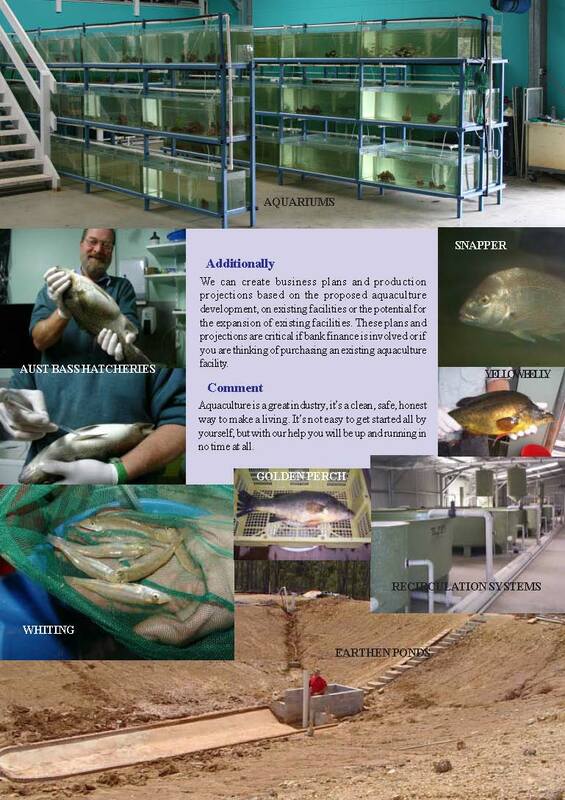 If you want the best aquaculture facility for the least cost then talk to our team of experts. 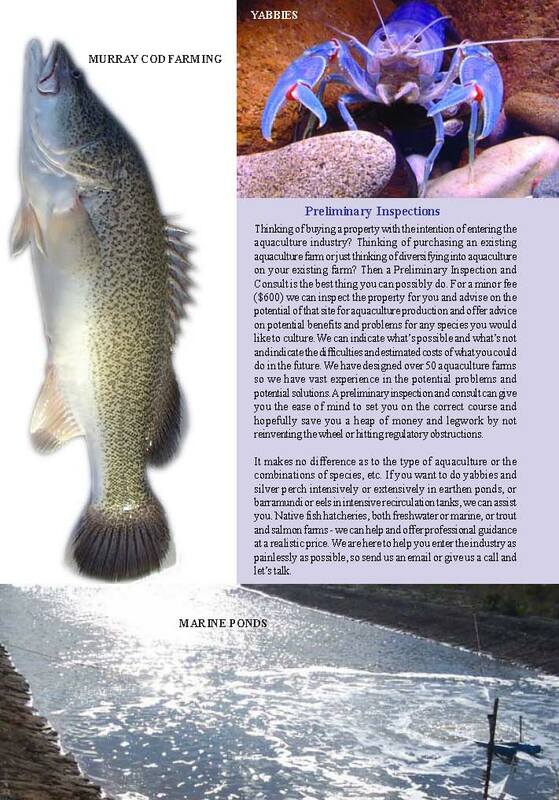 * Basic survey of the site to measure areas suitable for aquaculture. * Sit down with you and plan an aquaculture facility to suit your site, the species under culture, your farming methods and budgets, etc. 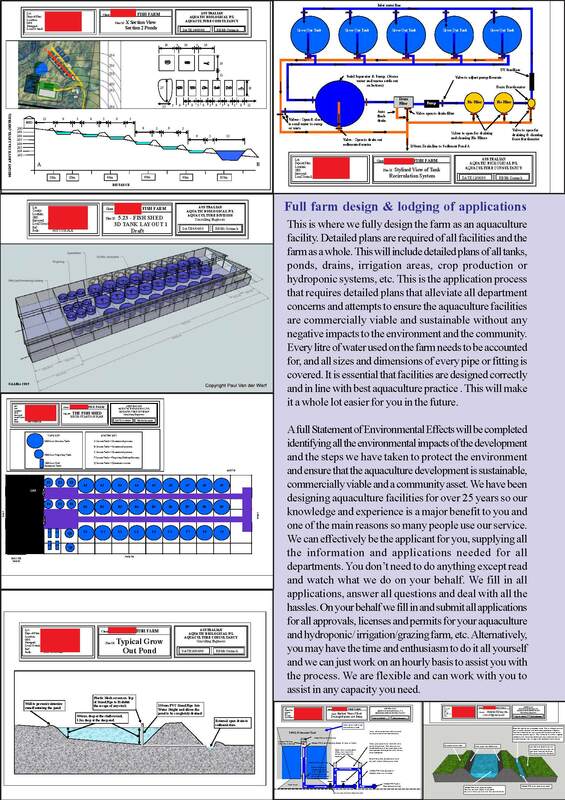 * Design the farm to meet all government standards, requirements, regulations, preferences and restrictions. * Design and peg location of ponds, effluent dams, water storage dams, irrigation areas and purging/packaging/office facilities. 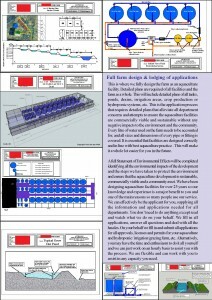 * Design all pond filling lines, drainage lines, air lines and power supply lines. * Compile a full Development Application to all government departments. Farm Management Procedures and Plans (Standard Operation Procedure(SOP), or Management Plan (MP) or Standard Operation & Management Plan (SOMP). Full Statement of Environmental Effects. Once all the above and a mass of other necessary information is compiled we will apply on your behalf to all government departments for approval. We can be the applicant for your development so that we deal direct with all departments. At a minimum you will need to apply to local Council and your state management agencies like DPI Fisheries or and State Development agencies etc. (Its different departments for different states). We complete all application, then submit all information to approval authorities, then respond to all requests for clarification or further information as they arrive. We continue to monitor the proposal and assist all departments with the necessary information for them to determine the environmental effects and to grant approval. So if you want a state of the art aquaculture facility, utilising best aquaculture practice, approved by all departments then contact us for further information and a consultation to consider your needs. If you are going to set up a native fish hatchery for freshwater species like Australian Bass, Silver Perch or Golden Perch, or marine species like Snapper, Whiting or Bream, you will soon discover that there is not a lot of information or assistance available. We can design hatcheries or for new hatcheries, AABio Aquaculture can work with you, in your hatchery, to teach you husbandry methods and procedures to get you on track and into production. If you need assistance – contact us. We have a wealth of experience with most species that have been cultured in Australia and can provide advice to new or existing farmers. In particular, yabby, redclaw and silver perch farmers regularly use this service – we can come out to your farm just for a few hours or so, work with you, answer all your questions, set you back on the right course and then return in a month or so to follow up on your progress. If you need assistance – contact us. For any number of reasons there may come a time when an expert witness report is required to assist you with a court case. Australian Aquatic Biological P/L offers this service including, production reports, farm and facility valuations, etc.